Rabea Hass has an appetite for change, and she’s not alone. In a Europe where nations tear themselves apart arguing about how to handle the flow of migrants, she felt she couldn’t sit by. So along with co-founders Jule (right) and Andi (left), she combined her passions for people and food to establish Kitchen on the Run. The project uses cooking as a means to bring together locals and refugees to share their stories and change the conversation about migration. The team have travelled from Southern Italy to Scandinavia with their container kitchen in-tow, offering a recipe for better integration of established and new communities. Having met around a kitchen table themselves, they know that’s where the best relationships grow, and have combined their expertise in culture, psychology and peace mediation to cook up encounters between people who would normally never meet. We caught up with Rabea to find out what other places can learn from bringing varied voices to the table, and how to keep that conversation going. What's your background and how did it lay the foundations for Kitchen on the Run? We believe in people. We believe in the importance of face-to-face engagement and the unifying power of good food. We love to travel and we’re curious about meeting new people from all over the world. In 2012 [Kitchen on the Run co-founder] Jule and I had the idea of building a container bar on a ship and travelling the world – being a meeting point for people to connect, to share stories, cultures and experiences. This plan was never realised, but nor was it lost. No one in our team had ever worked with refugees, but we have often created interpersonal encounters in very different contexts. Through my Masters degree in Peace and Conflict Research, my education as an international peace mediator and my research at the Hertie School of Governance on topics related to impact orientation, I was familiar with non-profit projects. I also knew how to get funding, and I had access to good networks. How has the ‘narrative’ about refugees and migrants changed across Europe in the last five years? The issue of the large flood of refugees across the Balkan route from mid 2015 onwards has suddenly come into focus. Since then, the mood in Germany has changed between euphoria and fear almost every month. Italy has had refugees for much longer and has had to face the problem more directly, so there the discussion is quite different. Refugees from Africa arrive at Italy's borders almost every day. They’re part of everyday life, but they are not actively engaged in it. The people of southern Italy often live in precarious circumstances themselves. They have to deal with their own livelihood. So there is no open racism, but also few offers for refugees to enter society. What inspired you to start Kitchen on the Run? We had observed that there were too few places where people from a refugee background and locals could meet. We wondered: how can integration can take place when we talk about others, but not with them? We’ve seen in recent years, and particularly in recent months, how Europe is tearing itself apart arguing about how to handle the flow of refugees. We are ordinary citizens, ordinary Europeans, but we realised we could no longer watch this happen: right-wing parties gaining prominence all over Europe, racist movements becoming more and more popular. So we decided to act. In March 2015, we saw the open call for the Advocate Europe Idea Challenge and the container idea popped up again: Kitchen on the Run was born. We refined the concept, wrote an application, built a Lego prototype and started a self-made website. We ended up in the top 10 winning projects. And so in June 2015 the adventure began. How did you choose the places that Kitchen on the Run would visit? We followed the route that refugees had traveled at the beginning of 2015: from southern Italy to Scandinavia. Who did you partner with to make the project happen? We joined forces with the Berlin organisation Über den Tellerand, because we basically had the same idea: bringing together refugees and locals. We’ve been looking for collaborations with universities, especially on Design Build projects. At the TU (Technical University) Berlin, we worked together with architecture students to develop a kitchen with an open shelf concept. The students designed the mobile tables and chairs – and screwed them together right up to the last day! Before we went on the journey, we researched the places we were going and sought contact with local groups. In the run-up, we visited each city twice to build trust around our project and to get in contact with local organisations, such as Avanzi Popolo and Mama Africa. What was the importance of the mobile container design? We were in places that couldn’t have been more different: a park in the center of Bari; the backyard of a former match factory in Belle de Mai in Marseilles; a cemetery in Duisburg-Neumühl; outside a former hospital in Deventer which now houses start-ups; and by the harbour in Gothenburg. The container is a neutral space. The ‘barrier’ to entry is very low, and many people were attracted by the beauty of the design. We got into conversations about the open doors in public spaces. It also enabled us to reach groups of people who weren’t looking for an integration project and wouldn’t otherwise have come. The fact that all of our actions were visible everywhere around the container, putting tables together to form one big table, said to people: you are welcome at this table. What were the rules or ‘rituals’ for each event? At the beginning of the event, all the participants met at the container, got to know one another, and ate some starters. 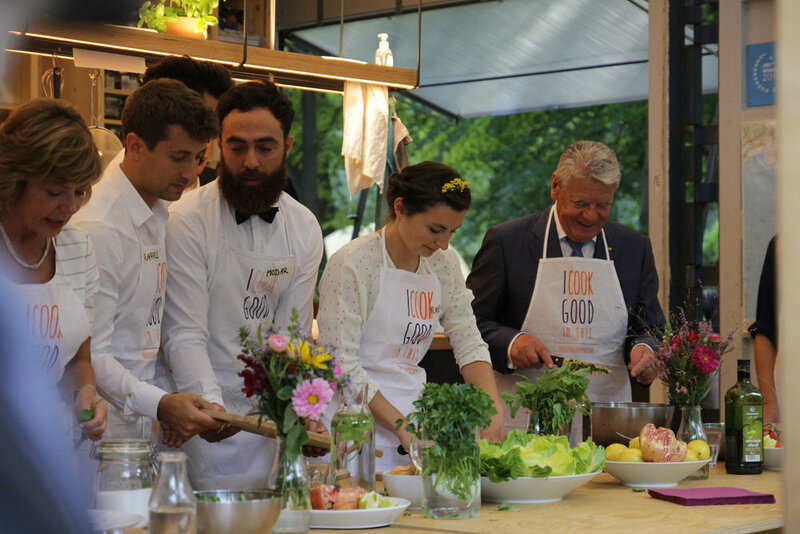 After a short introduction from our side, the hosts presented the recipe and explained how to prepare it. Then we started cooking. We always asked our table guests how to start the meal in their mother tongue – although we discovered that playing football seems to be one of the best international languages! We played together with teams from a local group called Mama Africa, close to the container. How did the people who cooked and ate in the container leave their mark? Everyone who has cooked in the container leaves their label there. Our map also gets more and more colourful from evening to evening, as every visitor adds a dot to show where they’re from. It’s actually a nice tool to connect people from the same area. Sometimes people got in touch with someone from their country just because they marked the same spot on the map. See how small the world is…! How did the project change the places it visited – did it change their story? We left behind communities who will continue cooking, eating and talking. Non-profit organisations often help to continue the dialogue once the container has moved on. For instance, we left visible traces in the district of Neumühl in Duisburg, which is contending with extreme right-wing politics and a former coal mine that’s left the district now struggling with high unemployment. But there’s also great warmth there. Through existing networks there, we received great support. After our departure, volunteers set up a regional group, which now organises an intercultural cooking event at the common kitchen table once a month. We created connections that persist: sustainability in urban structures. After completing our trip, we visited every location again. We found that local Facebook groups had been established so that everyone can network with each other. This trip was our field of experimentation, and we discovered that some experiences can be passed on. Why is food such a powerful way to share stories? How does it help people who have nothing to remember their cultures? It’s the feeling of community. When everyone is sitting around a beautifully laid table, it awakens their sense of home. Even smells are strong bearers of memories. We’ve often found that eating is a way of connecting. Many friendships have been formed at the kitchen table. It is a place of intimacy, where you’re interspersed with one another. You meet friends of friends; the group is big enough to find common topics, but not as large and distributed as a party. What have you learnt from the project that you would pass on to placemakers? We’ve learned that it’s essential to have committed local partners. We have been given a very different kind of support, since the locals contribute more directly, and it fosters a greater motivation to develop projects further. We’ve also appreciated the importance of the choice of location in relation to the structure of a village. Proximity to accommodation and places where you can meet on the street promotes sustainability, so it goes beyond just being an event. What’s next for Kitchen on the Run? From the beginning of May 2017, the container starts its second journey through Germany. Our motto for the trip is "Next stop home". We have two years of funding from the German Federal Office for Migration and Refugees, and we aim to set the project up well for whoever takes it on next. Our focus is on small towns, where the social infrastructure has been greatly compromised by demographic change and so there’s little to support integration – for instance there are no ‘club’ structures, like football clubs. We see ourselves as an incubator that can contribute to an active and inclusive neighbourhood. The notion of ‘them’ and ‘us’ runs deep in human psyche. Today's political climate is marking out the territory and fuelling feelings of tension among many. Few have take such extreme or terrifying journeys as these refugees, yet the conflict experienced in the places they arrive is increasingly common. Notions of ownership and immigration, stresses between established and new communities are occurring everywhere. Meaning that the approaches taken by this project have myriad applications, from rapidly gentrifying cities to areas of conflict among neighbours. Finding an accessible location, visible to the rest of the village, town or city and with space to spill out means this knits into the community. To root itself, a project needs to go beyond an event and become part of everyday life — a ‘third place’ for all to meet. Creating a neutral space with open doors welcomes everyone. A good-looking and unusual design invites curiosity, attracting the passers by who might not be actively looking to get involved. And the simple act of one large laid table is an invitation to sit down together. With these ingredients comes the beginning of a relationship. Getting everyone to sit down together is perhaps the hardest part. And while everyone loves an invitation it’s as much about the preparation and the follow up as the meal. On the ground partnerships are essential to ensure new relationships endure. Prep on the ground to get commitment, drum up excitement and make partners to involve local communities directly. Creating simple social infrastructures to follow up — like a Facebook group to stay in touch, or a reason to get together again — can keep the good work going.